Welcome to the Hindi / Bollywood rare records section of Records India. Bollywood films are generally musicals, and are expected to contain catchy music in the form of song-and-dance numbers woven into the script. A film's success often depends on the quality of such musical numbers. Songs from Bollywood movies are generally pre-recorded by professional playback singers, with the actors then lip synching the words to the song on-screen, often while dancing. Most notable singers of Bollywood are Suraiyya, Noor Jehan, Lata Mangeshkar, Asha Bhosle, Geeta Dutt, Shamshad Begum, Alka Yagnik, etc among female playback singers and K. L. Saigal, Talat Mahmood, Mukesh, Mohammed Rafi, Manna Dey, Hemant Kumar, Kishore Kumar, Kumar Sanu, Udit Narayan, Sonu Nigam among male playback singers. 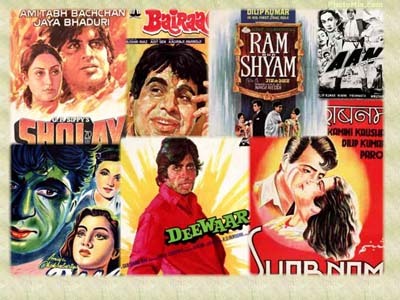 Remixing of filmi songs with modern beats & rhythms is a common occurrence today, and producers may even release remixed versions of some of their films' songs along with the films' regular soundtrack albums. Check out this insane dancefloor sitar funk from Pakistan - backed with some psychedelic sitar action! 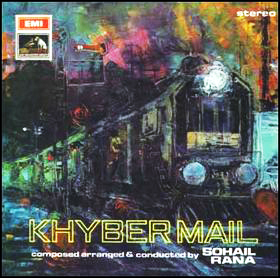 World renowned musician and composer Sohail Rana has recorded literally 1000s of songs in his native Pakistan and among them is ‘Soul Sitar’, the wildest sitar funk taken from the uber rare ‘Khyber Mail’ LP from 1970 - only issued in Pakistan & HIGHLY sought after by clued up beatdiggers ever since. The Dialogues of the BIGGEST BLOCKBUSTER IN INDIAN MOVIE HISTORY - 'SHOLAY'. Salim-Javed's words spun into 56 minutes of a unique experience. The selections featured in this 3-Record Set reproduce thedialogues of GABBAR SINGH, JAI, VEERU & BASANTI and Others in the full splendour of Stereophony. VERY RARE SET. This amazing soundtrack by R.D. Burman is one of the most popular & rare ones. 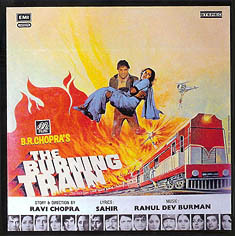 The highlight of director B. R. Chopra's 1980 Bollywood classic about an eventful train ride is "Pal Do Pal Ka Saath," which mixes qawwali Sufi music with grandiose Hollywood-Western strings. Also, the theme music is a wonderful east-west fusion with R.D. Burman himself singing. Must have for any collector. Once again R.D. Burman creates magic with this very popular but rare soundtrack featuring Superhit tracks like 'One Two Cha Cha Cha', ' Hum Bewafa Hargiz Na Thay' & 'Mera Pyar Shalimar' among others. Very Rare Soundtrack with a lovely colourful cover. This is an absolutely must have for any bollywood fan ! The pathos of the Ghazal and it's other Emotional implications artfully brought out in Begum Akhtar's unique style of singing Ghalib's ghazals. Features 'AAH KO CHAHIYE', 'TASKIN KO HUM NA ROYEN', 'DIL HI TO HAI', 'PHIR MUJHE DIDAR-E-TAR YAAD AYA' & 'KOI UMEED BAR NAHIN AATI' among others. Ghalib's lyrics have become doubly immortal in the consummate voice of begum akhtar. Must have Rare Collector's item !! Veera Zaara - Special Edition - Triple LP - Brand new! This incredible LP is a triple vinyl of the Yash Chopra Blockbuster in a beautiful presentation box, with great artwork from the film. LP'S 1 & 2 are songs from the film. LP 3 is the making of the songs, with the original versions with Madan Mohan reciting, along with dedications from Lata and Yash Chopra.There was a very small amount of these pressed, so are extremely rare to come by. Ananda Shankar; Reprise (licensed by Gramophone of India); 1970; Indo-rock legend, world-famous for Moog/sitar/tabla Doors/Stones covers, but his own tunes are best, particularly one in which he speaks(!) about getting in touch with the spiritual; ideal starting point if you're just getting into hip, modern Indian music; Light My Fire, Jumpin' Jack Flash, Snow Flower, Mamata (Affection), Metamorphosis, Sagar (the Ocean), Dance Indra, Raghupati; best copies left ; Indian pressing. This special record features KALYANJI ANANDJI'S Famous film hits and one original composition of BABLA too, all alchemised by the genius of Babla's imaginative arrangements. Features Hits like 'MERA JEEWAN KORA KAAGAZ', 'ARE DIWANO, MUJHE PEHCHANO', 'ZINDAGI KA SAFAR', 'KYA KHOOB LAGTI HO' & TITLE MUSIC OF 'JOHNNY MERA NAAM' among others. DISCO DEEWANE is 'THE' Album that changed the whole Disco scene in India. Launched in 1980 with music by Biddu of 'KUNG FU FIGHTING' & 'DANCE LITTLE LADY DANCE' fame & the voice of Pakistani singer NAZIA HASSAN, the album featured hits like 'AAO NA', 'DISCO DEEWANE', 'LEKIN MERA DIL', 'TERE KADMON KO' & 'DIL MERA'. 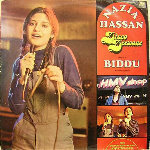 Nazia's brother ZOHEB HASSAN also sang on the album along with writing and doing the music for some of the songs. This is a RARE Collector's item.